Merging crowdfunding with blockchain technology, Acorn Collective helps startups meet their financing requirements in a much more simpler and easy manner. Acorn Collective is a decentralized platform for individuals and parties that find funding is an issue for their innovative services and products. Acorn allows them to connect with investors who are willing to donate money for discounted services in the future. Crowdfunding is a relatively contemporary concept, having its roots in the early 2000s. The services really kicked off with Indiegogo and Kickstarter in 2008 and 2009. The ability to raise money without having much to invest, showing only what a product a service can do, and a promise to deliver the services or the product to investors at a discounted rate is undoubtedly a service which is key to a successful start-up. Think “kickstarter meets blockchain” and delivers even more. This is what Acorn Collective is all about. The platform goes beyond what any other crowdsourcing is capable of by offering an easy access to startups for investors from all over the world. The platform is free to use and allows any legal project to seek funding from all manner of interested backers. 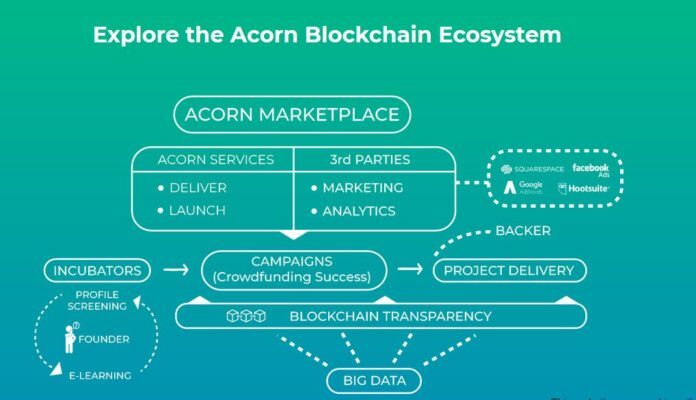 With Acorn Collective, fund seekers are incentivised because the platform will not charge them a commission fee, or any money handling charges apart from standard transactional rates, which are minimal in comparison.The free nature of the platform also means that projects which are rejected by traditional crowdfunding platforms due to little incentives in the shape of commission fees can seek funds at the touch of a button. The transparent and open nature of blockchain technology also gives the users a clear view on how their invested money is being used by startups, enabling a better control of funds gathered, and attracting investors who truly value, value. The Crowdfunding Hub, the main service of the platform. A marketplace to sell post funding services and products by startups. Acorn’s Token, the OAK to facilitate transactions within the platform. The platform has its own ERC20 standard token, the OAK, that will be used for transactions within the ecosystem. Backers and investors alike will pay fund seekers using OAK during the funding stage and can then buy services or products in the marketplace using the tokens. OAK will be on sale during its main ICO that starts on 26th May, 2018. 25 million OAK will be available in the sale with a price-tag of $1.40. The platform is currently undergoing development and will roll out its early product build, along with crowdfunding this year. With its platform going live, Acorn Collective will open the doors of opportunity for fund seekers that have been denied in the past.